Nowadays Retail Marketplace has become very competitive as consumers are given infinite choices when making a purchase. Retailers are thereby forced to utilize their customer’s time efficiently failing which it can prove to be a loss or ‘cart abandonment’ for them. 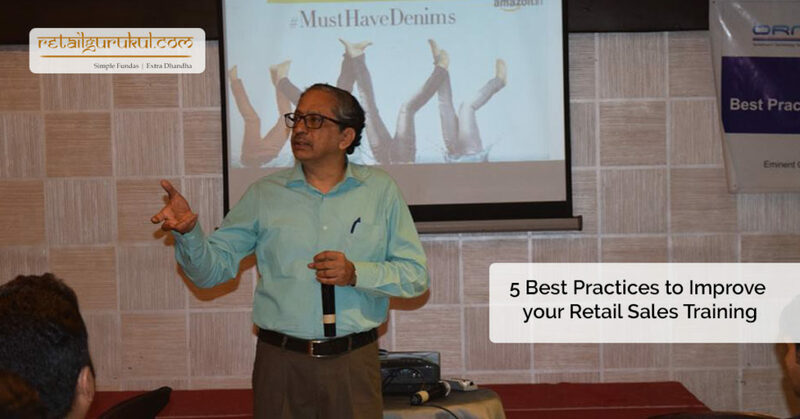 Our experts at Retail Gurukul share five best practices to improve your retail training program. You cannot expect your salesperson to only learn from past mistakes in retail business because his one mistake may have lead to loss of a loyal customer. Thus experts suggest retailers should conduct Sales Training Programs for their employees. This program should include retail sales training, customer service, and retail inventory management training. One critical best practice in the retail training program is goal-setting. It’s a must for retailers to set a goal, as this will help your employees to be focused and motivated. Before starting the program the trainer should set two objectives – some short term goals or low hanging fruit that can be achieved at the end of the program and one serious medium to long term goal for retail business development. Retailers should make an effort to explain the importance of the retail training program to their employees and encourage them to take full advantage of this program. Trainers can address common issues that the employees face in their routine sales life like dealing with difficult customers, improving employee’s sales skills, etc. Employees should also be trained to use different software like POS, Inventory management, etc. with a demonstration. Retailers can use the opportunity to update or develop a Standard Operations Procedure booklet that has the terms and conditions and best practices of the retail stores, rather than just verbally communicating them to their employees. There is nothing as the perfect training method. The main purpose of the retail sales training program is to train the retail store’s employees. Some retail employees prefer classroom training and others are ok with e-learning. Some prefer short-term courses and some might prefer long term. 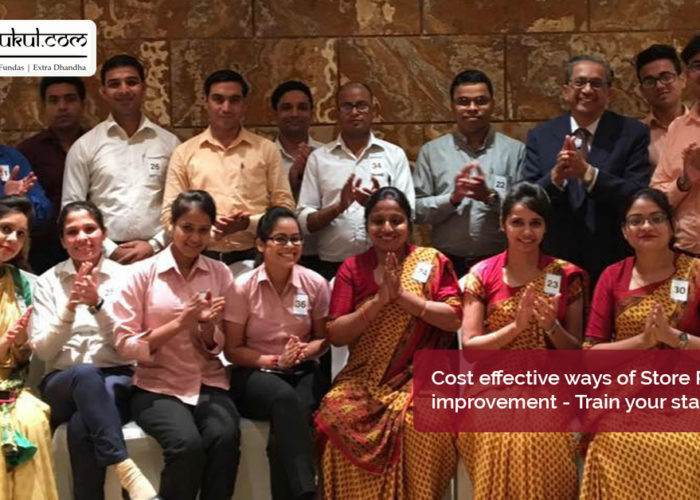 Thus, it is the responsibility of the retailer and the trainer to select the apt training method for their employees. Retail Gurukul offers both face to face and e-learning programs. Both short-term ex- one day and long-term – Once a month for say 6 months or Omni channel training. Face to Face once in 3 months and short 10 to 15 minutes videos on a weekly basis. Next step is to measure the difference in the sales revenue before and after the implementation of the retail training program. This is known as the ROI (Return on Investment) and is often in the KRA of the person who has hired the trainer. This can be measured by comparing the average transaction amount, sales per square feet, POS system usage, etc. Even if you are the best retailer it is not necessary that you can be good at training your employees. Alternately your busy schedule makes it difficult to train your employees or you may just lack time. Executing a good Retail Sales Training Program requires planning, commitment, perseverance etc Thus, Retailers get help from experts to gain higher productivity, lower employee turnover, and better engagement from team members, and most importantly stronger customer loyalty. These were some best practices of retail sales training to improve your store’s retail training program. The Retail Gurukul team includes professionals from the Jewellery business across various levels of expertise, experience and roles. Our Chief Consultant & Trainer – Shivaram is a much sought after Mentor, Consultant, Trainer and Speaker across multiple industry platforms. Shivaram has a wide range of contacts across in the jewellery / Jewelry industry and beyond, which he leverages to meet clients’ objectives. Talk to him today! You can also contact us for custom and onsite retail sales training programs. 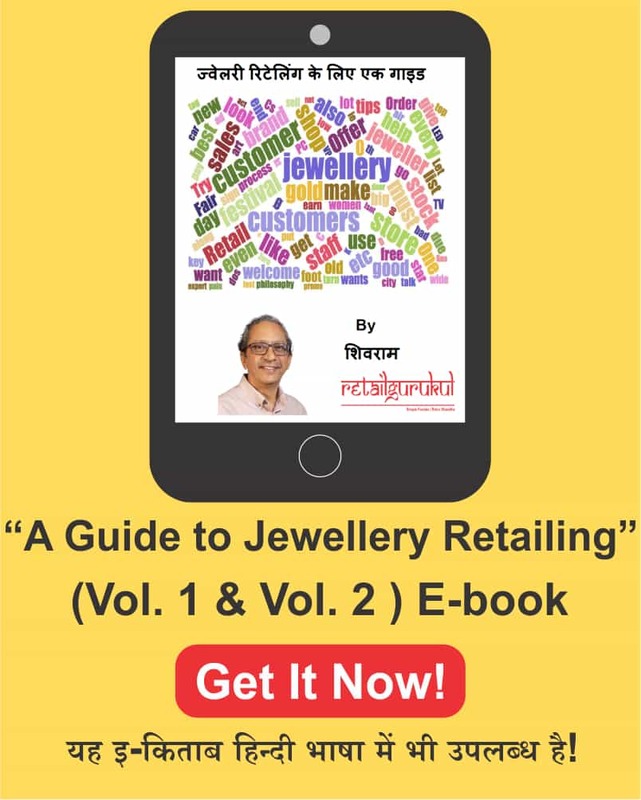 Retail Gurukul is conducting 8th Edition of Best Practices in Jewellery Retailing Workshop at Mumbai – Extra Dhandha, Simple Ideas by Shivaram. Apply your learnings immediately on Sat n Sunday at IIJS. Fees. Almost free for it’s value ! @ 11,800 if paid before 31 Dec, 14,999 after 1st Jan, & Rs. 17,499 after 15 Jan. Hurry and book your session now!